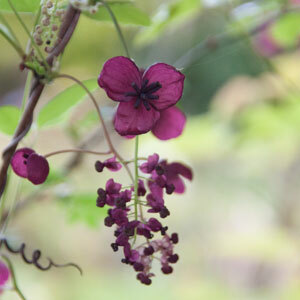 A cross between Akebia quinata and trifoliata not seen very often and reputed to be the best fruiter. A semi-evergreen climber. Attractive dark green leaves above blue-green beneath, purple tinged in winter. Spicely fragrant racemes of chocolate-purple flowers, followed by fruit. Max Height 10m. Max Spread 3m to 7m. Flowers March to April. Fruits August to September. Full sun. Hardy.